The Red Creek Art department is pleased to announce that we have a national gold medalist in our midst. This Scholastic Art Awards is the largest art show in the country with over 340,000 entries at the National level. Red Creek's junior class president Carmen Alice Brathen has won a gold medal on the national level. This is an unbelievable honor and illustrates the talent and dedication of Carmen in her work. 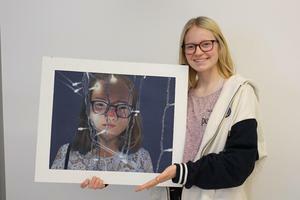 The winning piece is a colored pencil drawing of her friend Mina titled "Shine Bright Mina". Carmen and art instructor Susan Stanistreet will attend the awards ceremony in NYC. The ceremony is held at Carnegie Hall in NYC where Carmen will walk the stage on June 6th to collect her Gold Medal. If you see Carmen please congratulate her on this incredible achievement!